CES 2017 just wrapped up, and with it, we got a clear peek into the major trends that will dominate PCs over the rest of the year. Many of the important advancements are really continuations of previous ideas, some of which had lost prominence but now are surging back to the front thanks to new devices. In other words, what’s old is new again, but that doesn’t dampen the way it will change the computing world in 2017. That hasn’t dampened anyone’s enthusiasm. Virtual reality’s presence at CES 2017 was serious, taking up significantly more space than the previous year. And there were plenty of announcements. HTC took the veil off its new Tracker system, which lets third-party companies build peripherals to use with Vive experiences. That of course opened the floodgates for the announcement of peripherals, ranging from toy guns, to gloves, to baseball bats. We also saw a kit from TPCast that turns the Vive into a wireless headset. It was announced prior to the show, but CES 2017 was our first chance to try it out – an important milestone, because wireless VR often has problems. To our surprise, TPCast worked well, without any noticeable lag. The biggest restriction is battery life. You can play wirelessly for up to 90 minutes. The money is staying around, and VR will keep improving so long as that’s true. That’s important. In the past, VR fads have fizzed out as companies headed for more profitable shores. This time, the money is staying around, and VR will keep improving so long as that’s true. The most important problem facing the PC this year is a classic; memory, and how to deal with it. Time and time again we heard different companies, in their own ways, outline their plans to deal with the coming data crunch. AMD, which plans two new chip architectures this year, is implementing aggressive new data management schemes in both. Ryzen, the company’s new processor, will have a massive cache paired with a prediction algorithm that can learn what data software is likely to need and call it up before it’s required. And AMD’s new GPU architecture, Vega, is designed around a high-bandwidth cache controller. While built to work initially with High Bandwidth Memory 2, the company says Vega can support many memory solutions. It can even be hooked up directly to long-term memory, if the storage solution is fast enough. Intel, meanwhile, is positioning itself to lead a revolution in long-term memory with Optane. This new technology, first teased in 2015, will come to PCs sometime in 2017. Its speed supposedly exceeds that of any solid state drive, even those connected over the most modern NVMe interface. Initially, it will be sold as a super-fast cache drive, but the plan is to ramp it up to become main storage. That, if it works, would change a fundamental pillar of PC architecture. Home computers have, since their existence, paired fast low-capacity RAM with slow, long-term storage. Technology like Optane might make that unnecessary by accelerating long-term storage. RAM’s days might be numbered. Even if that proves untrue, it’s clear fast storage is a priority for everyone. Seagate, the well-known hard drive brand, told us it expects demand for capacity to hit 2,900 exabytes (one exabyte is one million terabytes) by 2020. That’s a massive amount of data, and it’ll be impossible to handle without faster ways to access it. High Dynamic Range was arguably the television technology of 2016, even more so than 4K resolution. Our Senior Editor of Home Theater and Audio, Caleb Denison, raves about it at every chance. Now, that same technology is coming to monitors. If you haven’t heard of it, here’s the deal brief. High Dynamic Range aims to increase contrast by allowing a greater range of brightness. In doing so, it makes images brighter and more lifelike. The blinding light of a sunny day looks dampened on a “normal” display, but with HDR, it can truly shine. HDR’s arrival on monitors could mean another leap forward in quality. However, all the monitors we saw at CES, or which we know will be available later this year, are missing HDR’s dance partner; OLED. The pair works best together because it’s hard for a traditional, backlit LCD to hit the brightness peaks HDR can achieve without blowing our black levels. Unfortunately, CES 2017 didn’t give us hope that OLED will be available in desktop monitors soon. Still, it’s good to see monitors focusing on quality more than they did in the past. Johnson Jia, Lenovo’s Senior Vice President, PC & Smart Device Business Group, told us “Our culture is becoming increasingly visual in the way we consume content. In fact, our customer surveys show that display is the number one experience customers care most about.” Frankly, we think consumers have cared about display quality for awhile, but at least companies are now listening. Chances are great that if you’re reading this on a computer, it’s a PC running Windows on an Intel processor. This partnership, sometimes called “Wintel,” is nothing official, but it’s been the norm for two decades. Google’s Chrome OS, released in 2011, was the first potential threat. 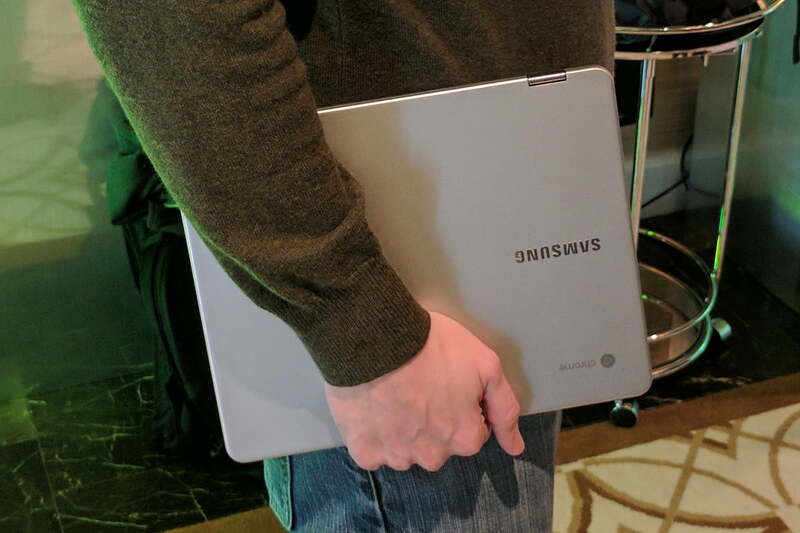 And it in fact did catch on, in a way – Chromebooks often trend on Amazon’s best-selling notebooks list. They’re simple, they work, and they cost less than $500 even with sweet hardware. That’s enough for most people. Unfortunately, though, app support remains an issue. Chrome OS just doesn’t have many apps, and that often leaves it off shopping lists. Samsung’s Chromebook Plus and Pro have an answer for that, as they offer full support for Google’s Play Store. Yes, that means you can run Android apps. And unlike previous Chromebooks that tacked on this support after the fact, the Plus and Pro have all the features needed to make the apps work as they should. Chrome OS users will be able to tap into a selection of apps that includes millions of titles. However, as Moorehead went on to point out, “developers will need to do a lot of improvement to the apps as most Android apps are designed for 4” displays. Running a 4-inch app on a 13-inch display is a suboptimal experience.” While the potential of Google Play is intriguing, Wintel isn’t on its deathbed yet. You can read more of our thoughts on this here, or check out our hands-on of the Samsung Chromebook Pro.